Parsa Shamloo is an experienced Euphonium and Baritone player. He began playing in Rice Middle School under the direction of Jason Tucker. Throughout his years of middle school and high school band, Parsa established himself as a top player. In 2014-2015, Parsa was a member of the Greater Dallas Youth Orchestra Wind Symphony, a prestigious ensemble led by Dr. Nicholas Williams of the University of North Texas. After graduating from Plano West Senior High School in June of 2015, Parsa began his studies studying chemistry at The School of Natural Sciences at the University of Texas at Dallas. 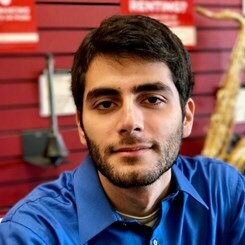 Parsa Shamloo is an expert in euphonium, baritone, and other brass instruments such as trombone, trumpet, and tuba.